On May 15, the documentary Cvetnoy Sektor (Color sector) was screened at the Central Journalist’s House (Domzhur — Домжур) in Moscow. The filmmakers of the documentary include Andrey Tatarchuk, a journalist with indirectly Kremlin-financed Baltnews.lv, and a Russian artist from Estonia named Sergey Chetvertnoy. The film’s focus is the revolutions in post-Soviet countries since the nineties. The coup in Latvia in 1991 that led to independence from the Soviet Union is featured prominently. In the movie, the filmmakers suggested that particular individuals, who later joined the Latvian military, shot at Latvian civilians and were involved in the deaths of five people during a fire near the Ministry of the Interior (MoI). The gunshots started on January 20, 1991 between the Riga Special Police force under Soviet comand and the Ministry's guards. Five people died — a student named Edijs Riekstins, two cameraman named Andris Slapins and Gvido Zvaigzne, and two policemen named Vladimirs Gomonovics and Sergejs Kononenko. The testimonies of the witnesses were contradicting. Some expressed suspicions about a so called “third party” involved. By suggesting that the “third party” was the Latvian military, the narrative of the film undercuts a primary point of national pride among the Latvian people — namely the successful and peaceful nature of their transition to democracy and away from the Soviet Union. The film made the same assertions of protests toward independence in Ukraine in 2014. The film is not openly available, but in a Facebook video posted by Chetvertnoy on January 22, 2018, Dmitry Yermolaev, the Editor in Chief of the official Kremlin media outlet Rosiyskie Vesti Latvian edition accused two Latvian military officers of shooting at civilians. In 2005, the Latvian Constitution Protection Bureau (SAB) blacklisted Yermolaev as a Russian intelligence officer. We have an audio recording of one of the highest Latvian army officers who have clearly named two out of four people who were in the Basteykalns and shot. One of them was Didzis Mejers, a colonel of Latvian National guards, who has passed away already. The second was the former General of Latvian Armed forces Raimonds Graube. First, I’d like to say, and maybe you could include it in your story, that I made the film without Dmitry Yermolaev. I know Dmitry Yermolaev, but it is my film. I am the Director, the Author. This is one thing. Secondly, I met Dmitry three or four times and I did not see Dmitry’s hostility towards Latvia, and attempts to influence me and turn into an agent. There is no propaganda in this movie, and I did not notice anything suggesting that Dmitry Yermolaev is a spy or KGB officer. Tatarchuk’s Facebook post five days before the film’s premier, suggested that he indeed believed the film was independent and without any propaganda. The first time I heard this version was many years ago. It is absurd, nonsense and a lie. I remember those times it was very complicated to get weapons and carry out an operation so complex. At the times of information warfare, the dissemination of information fog full of conspiracy theories and nonsense a Gebel’s time method is used — lying to an extent that at least two percent believe you, and it is a lot already. From everything I heard and saw, frankly, there is not a single true word. There are some facts that are interpreted in a biased way. The SAB was not the only entity suggesting that Yermolaev was connected to Russian intelligence by carrying out smear campaigns against Latvia. According to a Russian news site Kompromat.lv, Yermolaev was using a nickname “Kornet” (Корнет) in Latvian news forums to discredit Latvian politicians and question Latvian democracy. This was also not the first time Yermolaev suggested that Graube shot at civilians during the coup in 1991. In November 2016, the assertion was published on Rossiyskie Vesti where Yermolaev works. The publication posted a transcript of a conversation with an anonymous source who was allegedly close to Didzis Mejers, the colonel of the National Guards that Yermolaev mentioned in the conversation with the creators of the film. - Provocation against the Riga OMON (ed. special police forces) was prepared since 1990 under the Latvian nationalist Georgy Efimovich Beshlebnikov — at that time he served in the Kirov police department in Riga and was one of the leaders of the Latvian “white berets” (ed. Police battalion — the first armed unit after Latvian independence). The operation to provoke Riga OMON, which did not become subordinate to the republican police, instead was subordinated to the commands of the Soviet leadership, was first intended to be entrusted to Beskhlebnikov. But it occurred to someone that the “white berets” did not even know how to hold the weapon in their hands. Then the provocation against the riot police was entrusted to the future employees of the 9th battalion of Zemessardze. - How many gunners were there? - Four. Graube, Meyers and two others fired at the MoI building. They fired from a pre-prepared position on the Bastion Hill, which opposes the building of the MoI. - Did you participate too? - I worked in one of the Riga police departments, and learned the story later from Didzis Meyers. Provocation against the riot police was prepared long time ago — they used people, secretly planted in the park in order to shoot, as it happened. - Graube or Meyers shot at the operators of the Podnieks group? - What I know from Meyers’ words that he shot, but whether they killed the operators, I can not say. I do not justify, but I try to explain the logic. 11 pm, the beginning of the 12 am, winter, dark, the park is poorly lit. Below — cameramen Zvaigzne and Slapinsh, a large Betacam-camera, similar to a grenade launcher. The cameraman stands up, puts the camera on his shoulder, as he leads, prepares to shoot — what do you think? You shoot first. Yermolaev published the interview on a Russian language blogging portal called IMHO Club. Later, a Latvian media outlet NRA.lv disproved the interview and labelled it a fabrication and part of Russian hybrid warfare, based on Graube’s comment. I was at Zakusala, that moment I helped to insure the protection of the barricades as one of the voluntary soldiers. Perhaps related to the film, Yerlalaev was spotted in Moldova together with the filmmaker Tatarchuk. 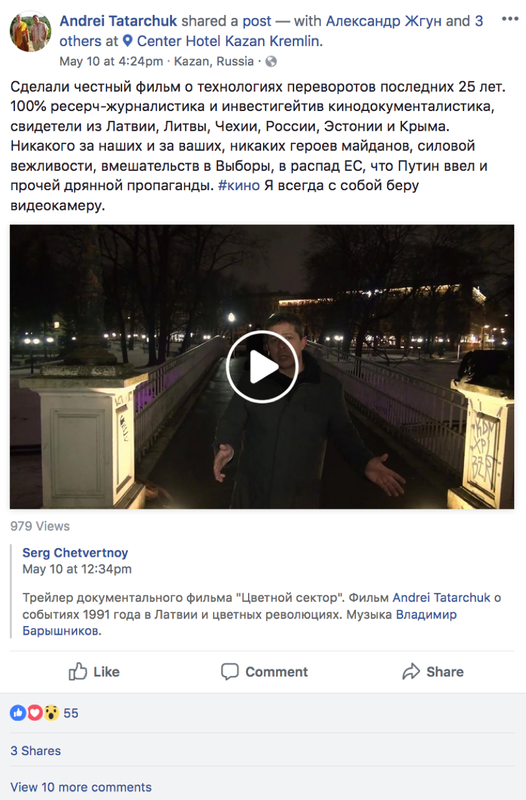 On May 25, 2017, the Facebook account of Zhurdom, the same place where the film was first screened, posted that Yerlalaev and Tatarchuk were detained by Moldovan police on their way to Tirospol — the capital of Transnitria, Russian separatist region in Moldova — to meet with witnesses of events in Latvia from 1990 to 1991. The post suggested it was for their co-authored book. The only media outlet that wrote about the premiere a day before it happened was Baltnews.lv — the same media outlet Tatarchuk works at. Also on the day of the premiere, the film was mentioned by The Russian Guild of Non-Fictional Cinema and Television. Right after the premiere, just two Russian language media outlets in Latvia wrote about it — Sputnik Latvia and pro-Kremlin Vesti.lv. In Latvian language, the news about the film started to spread two weeks after the premier when Neka Personiga aired a story about the film and the facts it presented about events in 1991 in Latvia. The same day other Latvian online media outlets picked up the story. It was nationalist conservative newspaper Latvijas Avize, daily newspaper Diena, the Russian language version online news portal TVNet, and online news outlet Delfi. These news outlets suggested that the movie was propagandistic and the claim about the former general of Latvian Armed Forces was false. 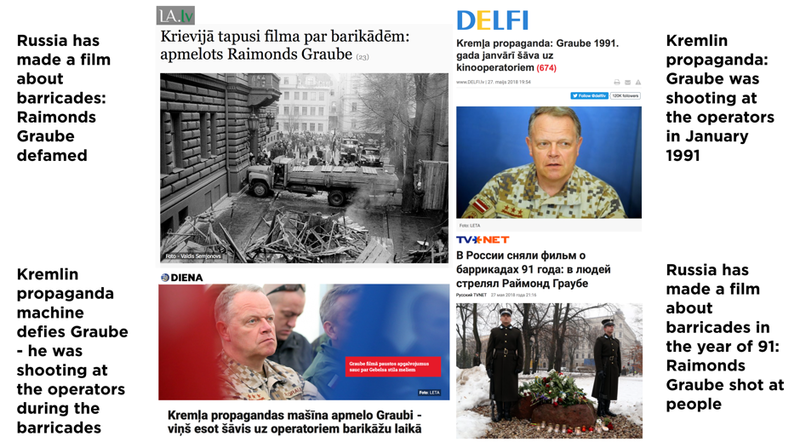 Russian language media outlets in Latvia like MixNews, Vesti.lv picked the story up from Latvijas Avize and produced headlines that suggested Raimonds Graube shot at people during the barricades. Another Russian media outlet in Latvia Press.lv picked the report by TVNet and used the same title. Though the media spread was small, TV3 show Neka Personiga gave the film an attention in Latvia. Coverage surrounding the documentary Cvetnoy Sektor was the second incident of Dmitry Yermolaev suggesting that Latvian Army General Raimonds Graube carried out a provocation by shooting at civilians in January of 1991. The author of the film, Tatarchuk, traveled with Yermolaev to Moldova a year before the premier of the film to research the very same topic. It suggests that Yermolaev was involved during the film production, to a larger extent than Tatarchuk claimed to journalists from TV show Neka Personiga. While the film was not widely distributed at the time of this report, but its aim was clear: to resurface old allegations of violence during Latvia’s transition to indepedence and away from the Soviet Union. Nika Aleksejeva is a Digital Forensic Research Associate at the Atlantic Council’s Digital Forensic Research Lab (@DFRLab).